Leiden Special Collections Blog - Articles - Prince Diponegoro: hero or rebel? Prince Diponegoro: hero or rebel? Javanese mystic and pious Muslim, the prince from Yogyakarta saw himself as the leader of a ‘holy war’ against the Dutch. Prince Diponegoro (Pangeran Dipanagara) met his tragic fate hundred eighty-two years ago. The so-called Java War (1815-1830) had come to an end after a long-lasting conflict. Prince Diponegoro (1785-1855) was the key figure of an uprising which affected most of central and east Java for five years. Javanese mystic and pious Muslim, the prince from Yogyakarta saw himself as the leader of a ‘holy war’ against the Dutch. Rebel for the Dutch, hero to many fellow-countrymen, Diponegoro and his followers were eventually defeated. On March 28th 1830 he was treacherously arrested at Magelang (central Java) by the victorious Lieutenant-general H.M. de Kock. This historical event was immortalized by two nineteenth century painters who embodied the two worlds: in 1830 by the Dutch Nicolaas Pieneman, and in 1857, after Diponegoro’s demise, by the Javanese Raden Saleh. Prince Diponegoro was sent away into exile to Celebes where he spent the remainder of his life under strict surveillance. 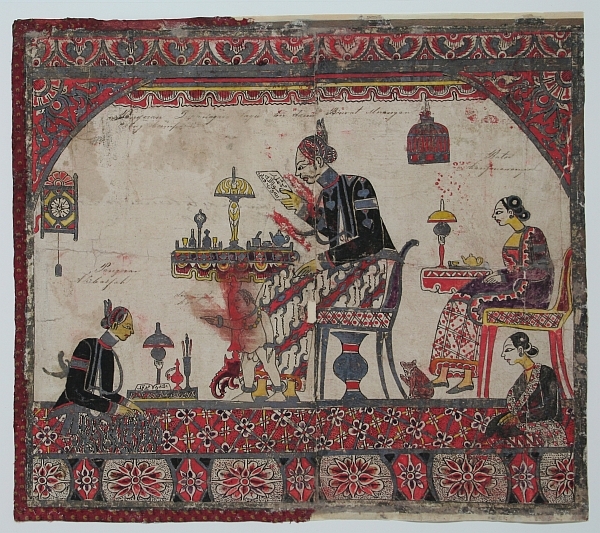 A coloured drawing held in the Snouck Hurgronje Collection depicts Prince Diponegoro sitting at a table in a cosy western style sitting-room: even the clock on the wall is ticking. His wife and two attendants keep him company. The small naked male figure is enigmatic: it is not a child nor a dwarf (panakawan) but could possibly symbolize a spirit. The composition of this remarkable drawing raises many questions in spite of the inscriptions in Malay. It is undated but the Tiffany-style table-lamps point to a late nineteenth century datation. Since the context of the creation of the drawing is unknown, its origin and purpose will remain a mystery. It seems though that the scene is a figment of the anonymous artist’s imagination several decades after Diponegoro’s demise. According to the inscription on top of the drawing, he probably meant to represent Diponegoro on the eve of the outbreak of the uprising: ‘Prince Diponegoro at peace with himself before going to war against the Dutch’ (Pangeran Dipanagara lagi berdamai buat merangan orang kumpeni). Retired in his country house outside Yogyakarta, is the pious prince preparing himself for the struggle, sunk into meditation and reading holy islamic scriptures? Diponegoro was already a legendary figure during his lifetime. The drawing bears witness to his memory and to his spirituality, and it is a valuable addition to the Leiden manuscripts which record Diponegoro’s history. In present-day Indonesia, Diponegoro has taken place in the pantheon of national heroes (pahlawan nasional). Finally, it is noteworthy to mention that the Oranje Boulevard in pre-war Jakarta was renamed Jalan Diponegoro after Indonesia’s independance. Blog by Marie-Odette Scalliet, former curator at Leiden University Libraries.